It is easy to shut the door on your stockroom and just forget about what is happening in there. 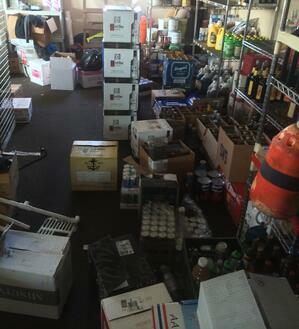 The chaos of a busy night can leave the stockroom in shambles and make taking inventory a nightmare. Not only will finding and counting bottles be more time-consuming, but there is also a good chance that you won't end up with accurate numbers. Take the time to neatly stack boxes and makes sure that everything has an assigned place. If things get out of hand and the organization starts to fall apart, be clear about who is in charge of cleaning things up. Be sure that staff is putting the freshest stock at the back of the shelf. That way, the older bottles get pushed to the front and used up before they are past their prime. One of the quickest ways to eat into your profits is to waste valuable inventory. Don't use inventory assignments as a form of punishment. Give your best, most detail-oriented employees this added responsibility and then arm them with the tools and knowledge they need to implement inventory management practices. If you have a team of trained employees who are well aware of their role in keeping things organized, then you will be able to run a tight ship and provide staff with valuable skills. The more consistent you are about making an appointment with your stockroom and keeping it, the more that taking inventory will become a habit. Refine the process as much as possible with specific assignments and a step-by-step sequence of tasks so that everything runs smoothly. Inventory shouldn't be a big event that employees dread. Instead, it should be treated like just another part of the job. When things don't go quite right, it can be easy to go into manager mode and focus on the mistakes. However, this strategy does little for employees morale, which means they won't be especially motivated to avoid these errors in the future. Take a more positive approach, and reward staff who do a good job can go much further in promoting a satisfying work environment and ensuring accurate inventory in the future. Even something as simple as a gift certificate to a favorite local shop can be a powerful signal to your staff. The inventory process actually tells you less than you think. You will get a pour cost, which is a very important measure of your profit margin. It is worth doing a regular inventory for that reason alone. But it is also important to understand what you won’t learn just by taking inventory. You won’t truly know whether your bar is maximizing profits. And you won’t truly know whether your pour cost is in-line or way too high. Many inventory control programs give you visibility into over-pouring and lost sales by adding the ability to compare usage to sales on each brand. Adding that component to your inventory will make you more money. Using these tools will power your inventory practices, reduce errors, and free up time for other management duties. Studies have shown that better inventory practices can increase profits by 24%. Just imagine what you would be able to do with that extra money. While taking inventory might never be fun, it shouldn't be ignored or done haphazardly. By putting just a few of these inventory best practices into use, you can streamline the process and increase profits. *Originally posted on the Buzztime blog on March 29, 2018.